Leaked presentation slides outline AMD’s new CPU lineup and teases performance numbers for gaming. Last spring, AMD was able to return to the mainstream CPU market with its very impressive Ryzen CPUs. The launch followed years of uncontested dominance in the sector by Intel and gave PC gamers a serious alternative to consider for their gaming PC builds. The release of the Ryzen parts forced Intel to make some changes to their product roadmaps. It is believed that Intel rushed the launch of its Coffee Lake platform last fall in response to the competition from Ryzen (and AMD’s HEDT-class Threadripper platform). With Intel just now preparing the release of the Coffee Lake parts that failed to make the fall launch, AMD’s Ryzen successor is rumored to be ready for prime time as well. VideoCardz published a set of leaked press slides with all the juicy information on the new Ryzen 2000 series products, including details about the new X470 motherboards. The full Ryzen 2000 CPU lineup runs from $99 to $369, offering increasing levels of performance for your dollar. The star of the launch will be the Ryzen 7 2700X, an 8-core/16-thread CPU with a turbo clock capable of 4.35Ghz. The 2700X will replace the Ryzen 7 1800X as AMD’s top dog in the mainstream CPU market. The company says that the 2700X will average a 5 percent performance boost over the 1800X in games at 1080p. One of the leaked slides shows a wide range of game benchmarks comparing the R7 2700X to Intel’s similarly priced Core i7-8700K. 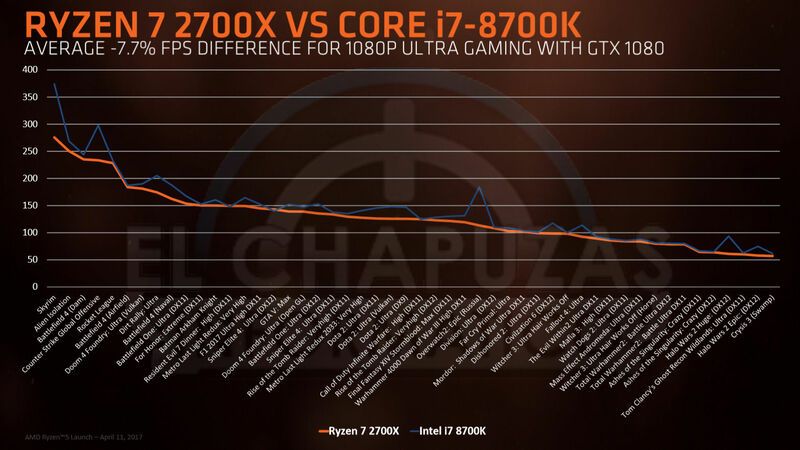 According to the slide, the 2700X falls short of Intel 6-core part by 7.7% at 1080p. Upon its release, the 8700K became the unquestioned PC gaming performance champion, and it appears that it will continue to hold that crown in the near future. Still, the 8-core Ryzen 7 2700X can possibly offer better performance than Intel’s Coffee Lake champ in applications that are optimized for higher core counts, like rendering and encoding. As an added bonus, current owners of AMD B350 and X370 motherboards will be able to take a BIOS update that will make their boards compatible with the Ryzen 2000 series. 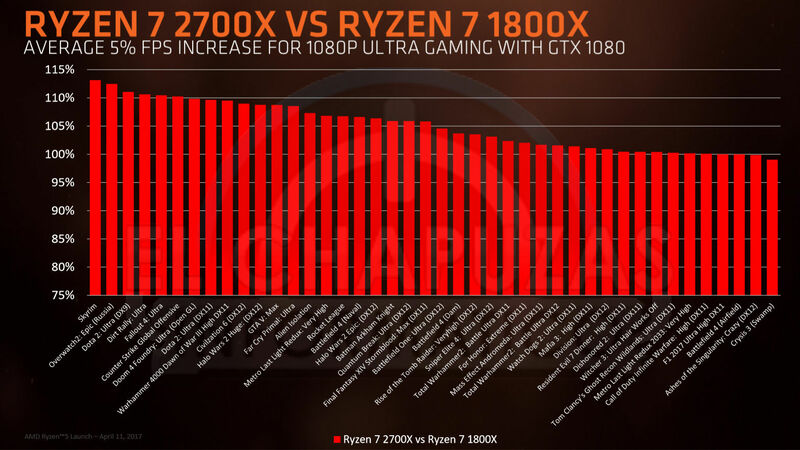 As usual, none of these numbers or claims are set in stone until AMD officially releases the Ryzen 2000 series (rumored to happen in April). Stay tuned to Shacknews for all the official details when AMD formally announces the product line. Yeah even the lower (absolute) latency may be purely due to increased clock. 105W TDP. Should've seen that one coming. Not a big deal in the short term, but they started doing that every year with Phenom to the point we had the FX-9590 at a ridiculous 220W. Hopefully they don't repeat that trend and this is just a short term bump for the refresh cycle. Next gen should be on a smaller node, I would hope it'd be more power efficient. GlobalFoundries' current 14LPP and 12LP processes are based on Samsung's 14LPP process. That process was not designed for high power CPUs so they're having to run it very hot to be competitive with Intel. GloFo's 7LP process is an all-new, in-house design so it could be anything from a major improvement to a total disaster. Unfortunately GloFo's track record over the last decade points towards the latter as the more likely outcome.